Baby Blimp May Fly Over Trump's Scotland Golf Course - Joe.My.God. 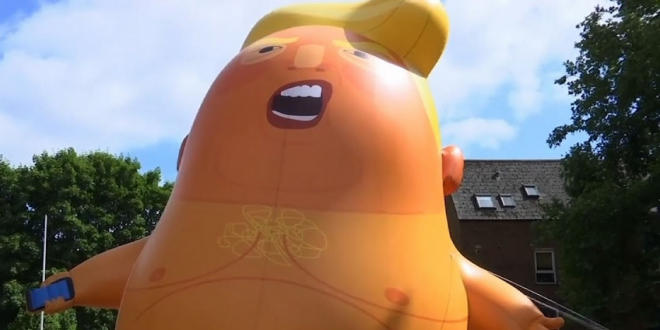 Thousands of people have signed a petition for the Trump baby blimp to be flown close to the President’s golf course in Turnberry, Scotland. Activists raised over £16,000 to make the balloon and gain permission to fly it over Parliament Square. Sadiq Khan and City Hall gave the go-ahead for it to be flown on Friday during the Stop Trump protest. The petition said that organisers had emailed National Air Traffic Control, the Civil Aviation Authority, the First Minister and the Chief of Police in Scotland. It added that because of airspace restrictions, the protesters need flight clearance to fly the blimp near the President’s golf course in Turnberry. Mr Trump is visiting his golf course in Turnberry, Scotland as part of his UK visit. It is thought that he will spend much of his time in the country playing golf.